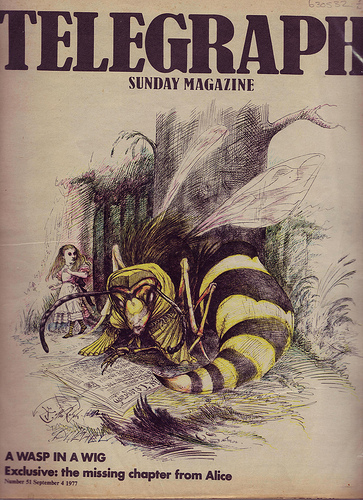 ‘The Wasp in a Wig’ was first published in the UK in this 1977 Sunday Telegraph colour supp, along with illustrations by Ralph Steadman. Inside the magazine there are further illustrations by Hugh Casson, Patrick Proctor and Peter Blake. While Dodgson was in the final stages of preparing Through the Looking-Glass and What Alice Found There, his sequel to Alice’s Adventures in Wonderland, he made a sudden revision by dropping a large episode where Alice comes across an old wasp wearing a wig. It was at the proofing stage while the book was in galley sheets when Dodgson made the decision to drop the episode with several strokes of his characteristic purple ink. 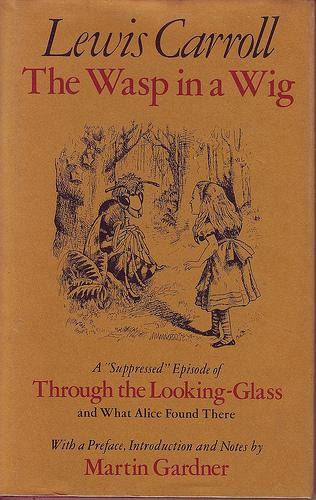 Prior to 1974, the only reference to this missing portion among Carroll literature is found in Stuart Dodgson Collingwood’s biography of his uncle, where he states that Through the Looking-Glass originally contained thirteen chapters, instead of the published twelve, the omitted chapter being the Wasp in the Wig episode. Scholars have questioned whether it really comprised a chapter or was rather an episode. More significantly, with the context these proofs provide, they now agree on its intended placement–just following the White Night chapter. Prior to the discovery of these proofs it was believed the Wasp episode appeared much earlier in Through the Looking-Glass: adjacent to the railway carriage scene. What prompted Carroll to omit this episode is explained in a letter from the book’s illustrator, John Tenniel, to the author while illustrating Through the Looking-Glass. He was not happy with the subject and wrote Carroll on June 1, 1870, that “a wasp in a wig is altogether beyond the appliances of art” and that if you want to shorten the book there is your opportunity.” Tenniel had exerted his opinions on other occasions with Carroll before: it was Tenniel, not Carroll, who insisted the first edition (1865) of Alice be scrapped due to the poor printing of the illustrations (the surviving copies remain one of the greatest rarities in English literature). When they came to light at auction in 1974, after missing for over a century, the “discovery” of the present set of proof sent shock waves throughout the world of Carroll scholars and admirers alike. After fruitless attempts of finding any trace of the suppressed material, the draft was presumed lost, and some Carroll scholars even doubted it ever had ever existed. In 1977, the episode was published, with Mr. Armour’s generous permission, by the Lewis Carroll Society of America. The publication prompted an enormous amount of attention, and numerous articles surrounding the publication of the lost episode appeared in the U.K. and America press at the time, including the Smithsonian (December 1977), Time magazine (6 June 1977), and the Telegraph: Sunday Magazine (4 September 1977). This copy bought from Stella and Rose books for a tenner. The Wasp in a Wig by Lewis Carroll. Illustrated by Ken Leeder after Tenniel. Includes preface, introduction and notes by Martin Gardner. First edition, published by Macmillan 1977. Hardback with dustjacket. The ‘lost chapter’ from Looking Glass: probably fits just after the White Knight. I think that when the jump occurs in the railway scene you might very well make Alice lay hold of the goat’s beard as being the object nearest to her hand – instead of the old lady’s hair. The jerk would actually throw them together. Don’t think me brutal, but I am bound to say that the ‘wasp’ chapter does not interest me in the least, and I can’t see my way to a picture. If you want to shorten the book, I can’t help thinking – with all submission – that this is your opportunity. The advice was accepted and the wasp was cut, and not seen again until 1974 when Sotheby’s sold six ‘slips’, or galleys, with revisions in Dodgson’s own hand, and the note, also in his hand, asking the printer to remove the episode from the book.